The High Grade Damascus steel used for this blade consists of layers of low carbon and high carbon mixture welded, forged and hammered several times to obtain Up to 200 Layers. The hardness of these blades is up to 55 HRC on the Rockwell scale providing sharp edges that are designed for lots of use. Precision heat treating methods are employed to provide the sharpest, most enduring edges available. 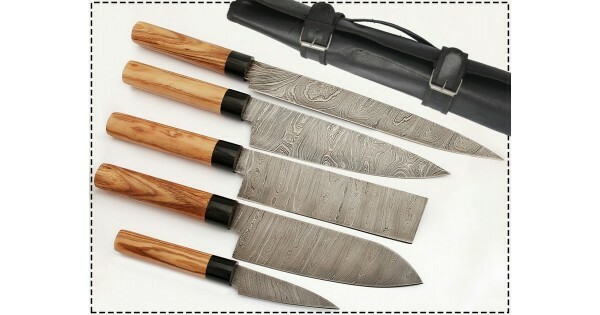 Only quality materials have been used to create this set of beautiful, hand forged kitchen knives. Featuring High Grade Damascus Steel blades and stainless steel bolster. The Ebony Wood & Kow Wood Handle. Comfortable in your hand, you will volunteer to be the cook tonight! For the collector or the Chef Master this set of knives are stylish and built to last. Chop, Dice, Slice and Carve your way to being a Master Chef with this set of versatile knives. HANDLE MATERIAL Nice Red Wood Handles of 5 inch long. BLADE MATERIAL Amazing Damascus ste..